Automatic flushers are a great way to encourage bathroom hygiene and restroom cleanliness. At Public Kitchen Supply we believe that automatic restrooms are a great way to keep staff and customers healthy. We created the automatic flushers category to supply our customers with all the necessary tools for an automatic toilet. The automatic flushers section includes manufacturers like American Metalcraft, Rubbermaid, and Browne. 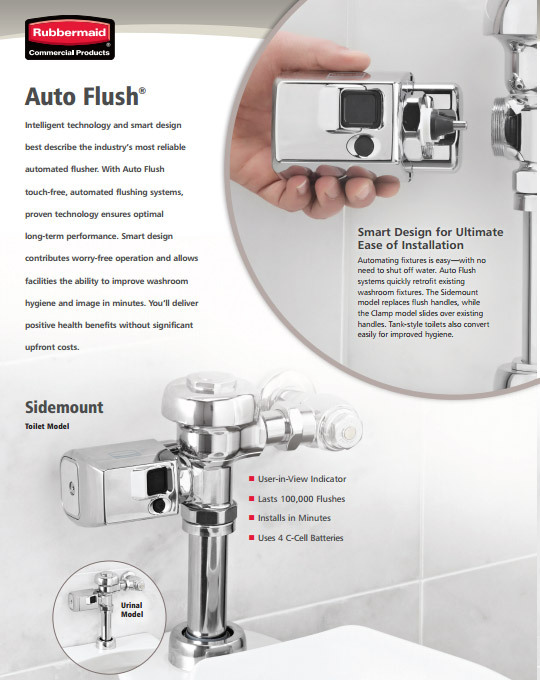 In the automatic flushers category you will find items like Rubbermaid's AutoFlush Side Mount for Toilet. This toilet mount is for commercial toilets. This mounting attachment takes a standard manual toilet and makes it automatic. Rubbermaid's Automatic Flush Side Mount for Toilet's battery will last for at least 3 years or 100,000 flushes. Rubbermaid includes a 10 year replacement warranty. Find other products in the automatic flushers category like Rubbermaid's Automatic Flush Tank Style. This automatic flusher can be used for tank style toilets, both commercial and residential. It features an object lock sensor, preventing unwanted flushes. It has a courtesy and a manual flush. The automatic flush tank will manually flush every 24 hours, eliminating stagnant water. Our automatic flushers category even includes simple flushing accessories like Rubbermaid's Eco-Bug Enzyme Table for an Eco-Urinal. Use this table to clean urinals, it will prevent odor and bacteria growth. Every establishment needs a restroom, it might as well be touches. Shop Public Kitchen Supply's automatic flushers category for all of your flushers and flusher accessories. At Public Kitchen Supply we provide the best manufacturers and brands, rely on us.